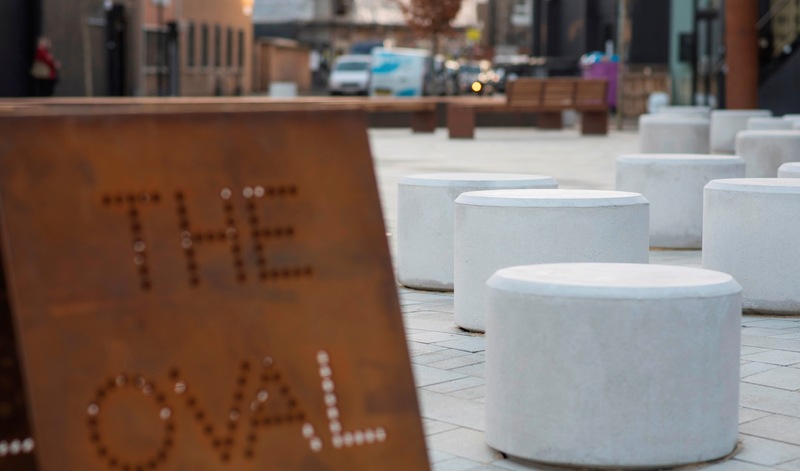 The Oval, which is just off Hackney Road, was once a hotspot for illegal car parking but thanks to a creative landscape design from London Borough Tower Hamlets, the new space is now fully accessible with safe seating areas, attractive lighting and a versatile stage area. The Oval, which is just off Hackney Road, was once a hotspot for illegal car parking. Appointed by contractors JB Riney for London Borough Tower Hamlets, Charcon recommended the best hard landscaping products to complete the aesthetics of the street scape, whilst ensuring the specified products would be suitable for a multi-use venue. A total of 300m2 of Charcon’s Andover Textured Block Paving in White, Silver Fleck and Light Grey was supplied, as well as 300m2 of Andover Textured Paving in White Grey and White to complete the look. Both products were chosen due to their stylish appeal and exceptional durability.